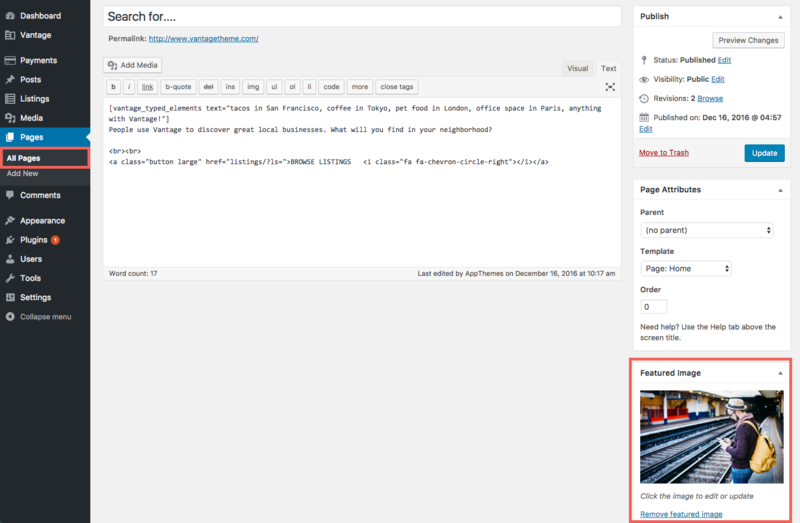 Option 2: Setting the Front Page Attributes Directly in the Page/Post Editor. 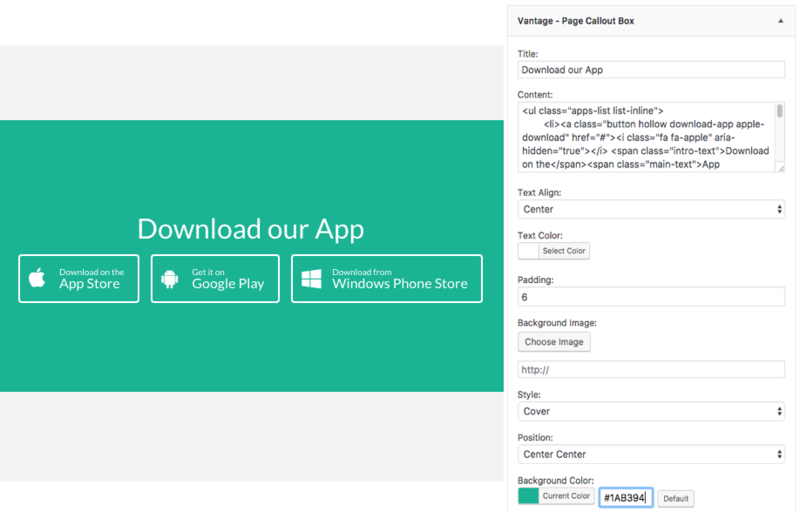 Vantage 4.0 uses a page template and widgets on it’s homepage which allows you to completely customize it to your liking. On new installs, your homepage should already be setup correctly. If not, the following tutorial will explain how to manually set this up. Go to your WordPress admin and click on pages, now browser through the pages and look for your homepage (it will have the following after the page title -Front Page). Your homepage should already be assigned the “Front Page” attribute. If now please see the sections below on how to do this. If a homepage doesn’t exist, go ahead and create a new page and add the following code to your new homepage. 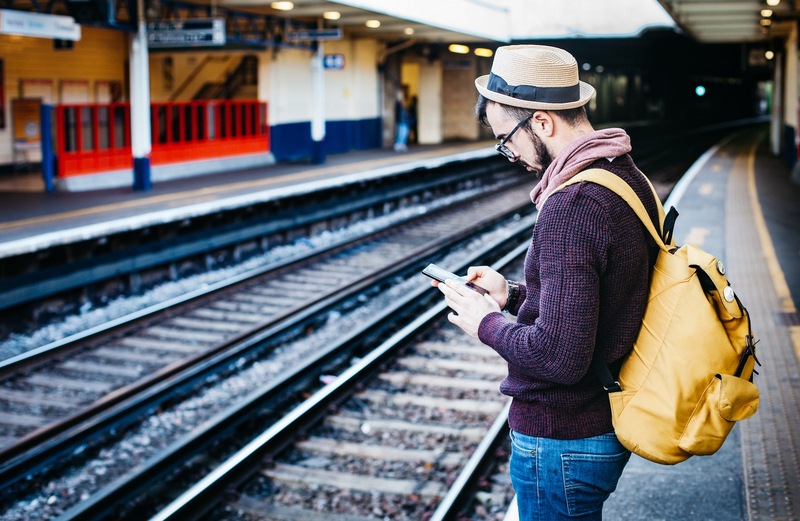 People use Vantage to discover great local businesses. What will you find in your neighborhood? You will need to set your new homepage as the front page of your site. To do this you can use the following 2 options. 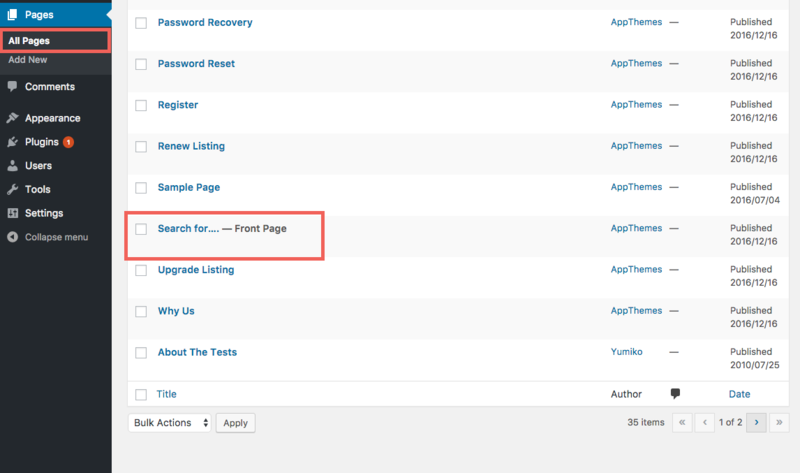 Option 1 allows you to set the front page attribute in your WordPress admin settings. 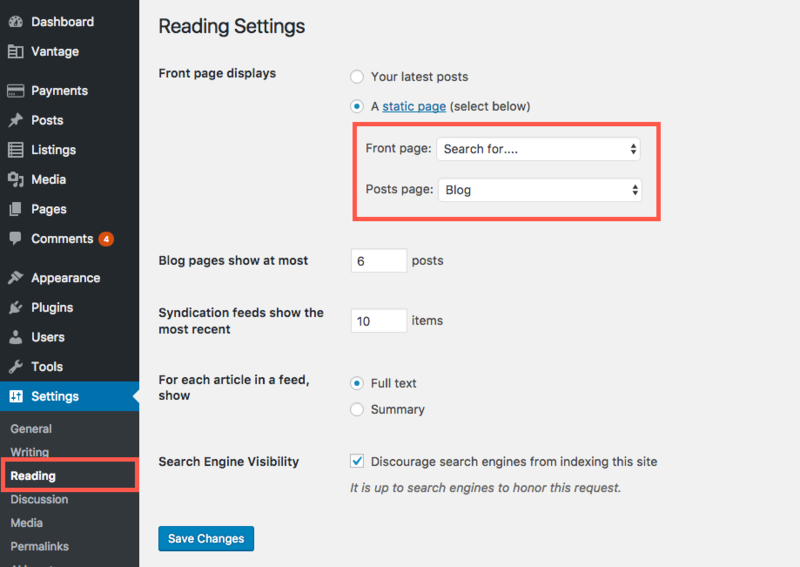 Go to your WordPress Admin and click on ‘Reading” under the “Settings” menu of your WordPress admin. Set the “Front Page” to the page you want to use as the front page of your site. 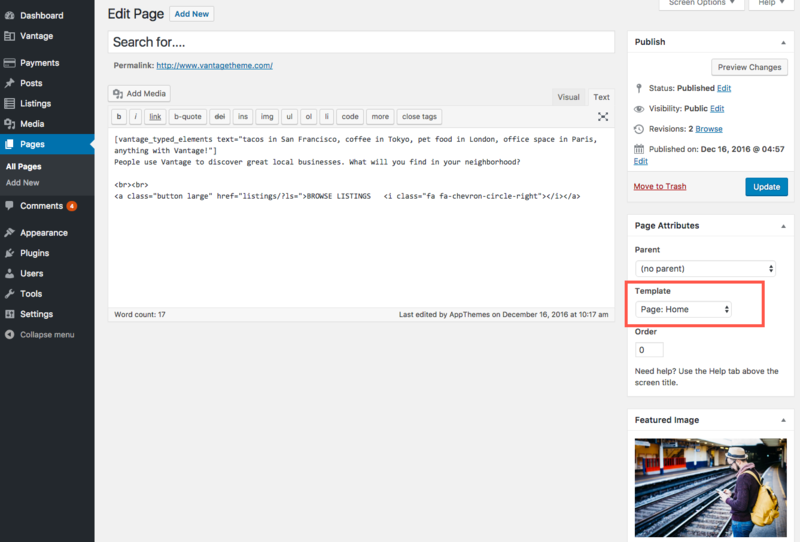 Option 2 allows you to set the front page attribute in your WordPress page or post editor. Go the Pages menu of your WordPress admin. Find the page you want to use as your homepage and click to edit this page. Update the page to save your changes. You can set your front page using the customizer also. Go to the Appearance menu from your WordPress admin dashboard. Click on the Customize link. Click on the Homepage Settings. Set the page you want to be your site’s front page. Without a main background image, your site will look pretty plain. Go to the Pages menu of your WordPress admin. Find your homepage and click edit. Go to the Featured Image section and set a featured image. You can choose to use an image that is already in your media library or you can upload one. We recommend to using a large high-resolution image (1920×1080 or greater) otherwise it will look pixelated or distorted..You can also choose to use the default image we provide, if you do not want to use your own. Here is a link to the default image we provide. Update the page to save the changes you have made. Pro tip: Sites like Pixabay and Pexels provide stunning royalty free images under Creative Commons and are great choices. There are some images you may need to re-position once you have added them. Custom CSS can be added to the custom css section of your WordPress admin to make these adjustments. Position Image Top – This will position the image from the top down. If you image is larger than the required size the bottom of this image will be hidden. Position Image Bottom – This will position the image from the bottom up. If you image is larger than the required size the top of this image will be hidden. 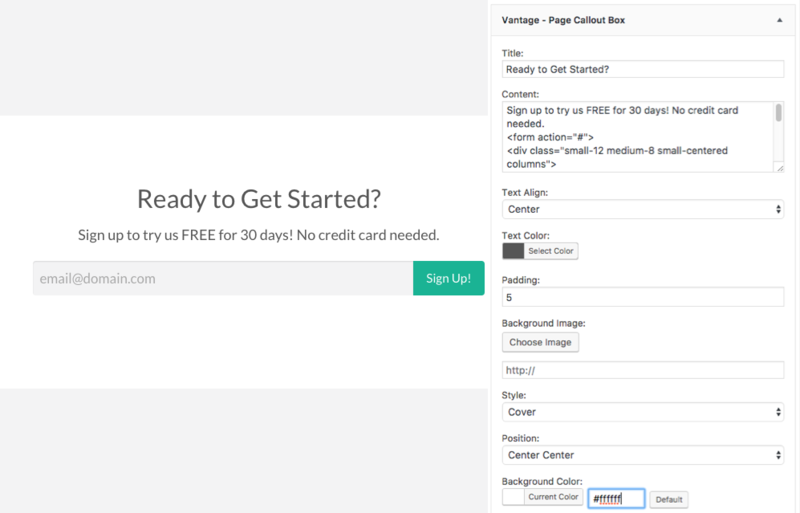 Vantage 4.0 uses widgets to layout content throughout your site. The homepage is no exception. Everything between the main header image and footer are widgets. Let’s go setup some content! Go to your WordPress admin and click the “Widgets” menu under the “Appearance” menu. Select the widgets you’d like to use from the list of available widgets. Add these widgets to the “Homepage” widget area. Widgets added to the “Homepage” widget area will display as content on your site between the main header and the footer. Pro tip: If you’re a more visual person, you can use the front-end WordPress customizer for a live view of your changes. Click the “Manage with Live View” button at the top of the widgets page or select the “Customize” link under the “Appearance” section. If you’d like to use the default callout widget content for the “Download our App” section, you can use the followings to do this. 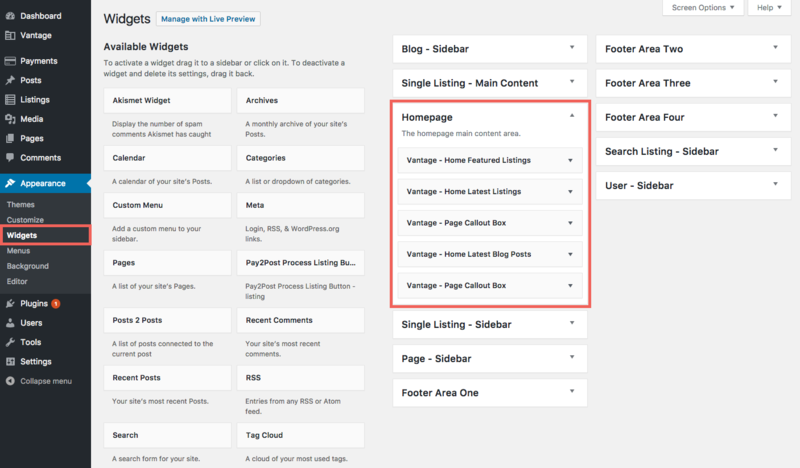 Select the “Vantage – Page Callout Box” widget from the available widgets list. Copy the settings from the screenshot in this section. Copy and paste the html from the box below into the “Content” section of the widget. Note: The code snippet above is only a placeholder. There is no “App” and links need to be added for anything to actually work. Consider it a starting point. If you’d like to use the default callout widget content for the “Ready to Get Started?” section, follow these steps. Note: The code snippet above is only a placeholder. The subscribe feature does not actually work. You can instead add 3rd party lead capture code (e.g. MailChimp, Constant Contact, etc). Consider it a starting point.